The Associated Press ran a story about the GOP immigration bill in June that carelessly handled information from Arizona Rep. Martha McSally. 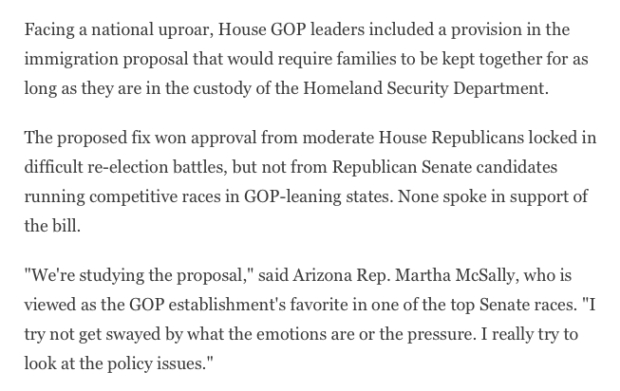 McSally, who is running for Senate in Arizona, spoke to AP reporter Steve Peoples for a story about the “compromise” immigration bill that included amnesty for 1.8 million immigrants, ended family separations at the border and secured funding for a border wall. The bill failed in the House after the AP story was published, but at the time, Peoples painted McSally as being insensitive to the plight of separated families. The Daily Caller reviewed an audio recording of the interview that revealed McSally was responding to a question about pressure from amnesty-opponents, not about pressure on the family separation issue. “You know, I’m doing 16 hour days with all of the things I have on my schedule so I try not to get swayed by what the emotions are or the pressure. I really try and look at the policy issues and whether it’s addressing what we’re trying to get done,” McSally responded. Such an agreement between a reporter and a source generally means that the reporter can use the information given to them but cannot identify the source by name. The Associated Press and Peoples did not respond to a request for comment.